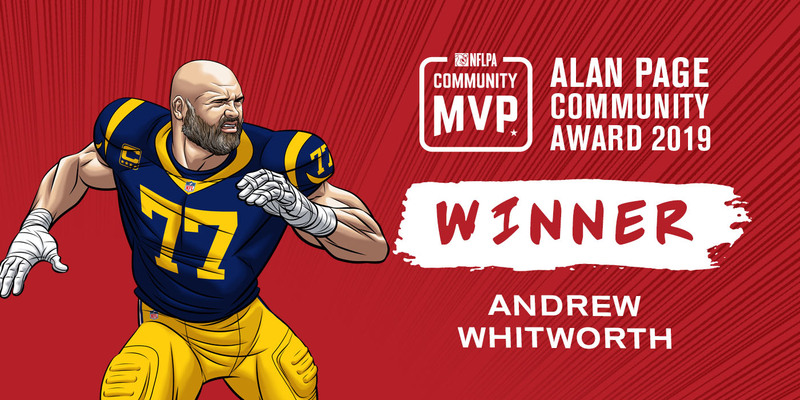 ATLANTA – The NFL Players Association announced Andrew Whitworth as the recipient of the 2019 Alan Page Community Award at its annual Super Bowl press conference on Thursday. In recognition, the NFLPA will donate $100,000 to The Big Whit 77 Foundation. Previously known as the Byron Whizzer White Award before being re-established this past fall, the Alan Page Community Award is the NFLPA’s highest honor. The award annually recognizes one player who demonstrates a profound dedication to positively impacting his team’s city and communities across the country in the spirit of the Pro Football Hall of Famer and social pioneer for whom the honor is named. Following the November mass shooting in Thousand Oaks, California, Whitworth donated his Week 10 game check (approximately $60,000) to the Ventura County Community Foundation’s Conejo Valley Victims Fund in helping the families of the 12 people who lost their lives. In that same month, Whitworth helped raise money for those impacted by the wildfires that had torn through California. The All-Pro lineman auctioned off his game jersey to benefit the American Red Cross Southern California Wildfire Relief fund. Whitworth’s efforts, despite him and his own family also being displaced by the raging fires, once again demonstrated his passion for helping others. During the 2017 season, his first with the Rams, Whitworth purchased 600 bikes and helmets for Grape Street Elementary School students around the holiday season. He also supported 2017 NFLPA Community MVP Chris Long and his First Quarter Literacy program by matching Long’s donation of $20,000 to provide 10,000 books to Los Angeles kids. Additionally, Whitworth and his wife, Melissa, have impacted youth and families in their home state of Louisiana through various campaigns within the Big Whit 77 Foundation. Whit’s Warriors provides financial assistance to high school seniors in Ouachita and Lincoln parishes. Since its inception, the program has awarded more than 200 students with over $400,000 in scholarships and school supplies since its inception. The foundation’s two other programs are Open Arms, which offers financial aid to families in the process of adoption, and Wish List, which partners University of Louisiana Monroe and Louisiana Tech athletes with local families for fellowship and fun during the holidays. Whitworth was chosen as this year’s winner from among five finalists following an electronic ballot vote that was open to all of his NFL peers from across the league. The finalists – Whitworth, Geno Atkins (Cincinnati Bengals), Kelvin Beachum (New York Jets), Von Miller (Denver Broncos) and Cam Newton (Carolina Panthers) – were selected by an external committee of judges across labor, media, sport and charity from among the 18 Community MVPs awarded during the 2018 regular season. Learn more about the Alan Page Community Award.